SYRACUSE, NY (2/22/2013) – Lev Saltonstall, Regional Coordinator for King Ferry Winery was at Food Bank of Central New York on Friday, February 22, 2013 to present a check for $4,415. King Ferry Winery, maker of Treleaven wines, generated the donation directly from tasting fees, with $1 from each $3 fee going to the charity. Thomas Slater, Executive Director of the Food Bank, was on hand to receive the check, as was Director of Special Nutrition Projects Peter Ricardo. “We greatly appreciate this generous donation. King Ferry Winery has been very supportive of our mission, and their efforts have put a lot of nutritious food into the community” stated Mr. Slater. Food Bank of Central New York is a not-for-profit organization working to eliminate hunger through nutritious food distribution, education, and advocacy in cooperation with the community. Food Bank serves as the primary food supplier for 268 emergency food assistance programs in 11 counties of New York State, distributing 12,273,003 pounds of food last year. 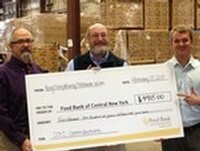 Food Bank of Central New York is a certified member of Feeding America. Visit www.foodbankcny.org for more information on the agency and its programs.